Find any card a spectator takes from a borrowed and shuffled pack. EFFECT: The magician tells his audience he has trained his mind to work like a computer. To demonstrate its computer-like capabilities, he asks a spectator to shuffle a pack of cards then, without looking at it, remove one card and place it in his pocket. Taking back the pack, the performer runs through it quickly, then goes through it again even more quickly and pulls out one card which he places face down on the table. The spectator removes his card from his pocket and places it face-up alongside the magician's card, then he's asked to turn the latter face up. If the spectator's card was the Three of Hearts, the magician's card turns out to be the Three of Diamonds; that is, matching in value and color. In the manuscript Ken gives you all the needed instructions and three alternative endings. 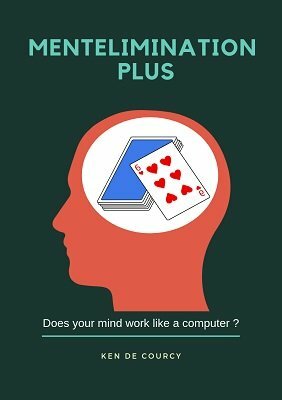 Although Mentelimination is a strong effect in its own right, it is also extremely useful for the occasion when a difficult spectator grabs the pack, removes one card and stuffs it in his pocket and says, “Now tell me what card I've taken!'" You can! Use any full deck of cards. Spectator shuffles himself the deck. The easiest way to perform this classic. 1st edition 1985, 1st digital edition 2019, 3 pages.